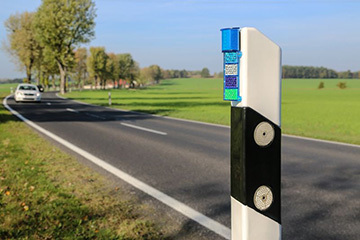 A multifunctional wildlife warning and protection system that combines a number of effective methods for keeping wildlife from crossing the road. It can happen to anyone on the road. And it usually happens suddenly and unexpectedly. The Multiwarn Wildlife Protector acts like a crosswalk light for animals. 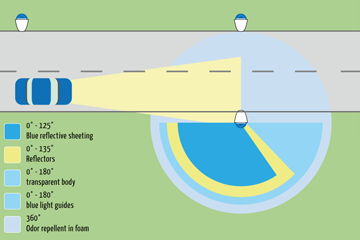 It switches to “BLUE” when cars approach to prevent wildlife from crossing the road. 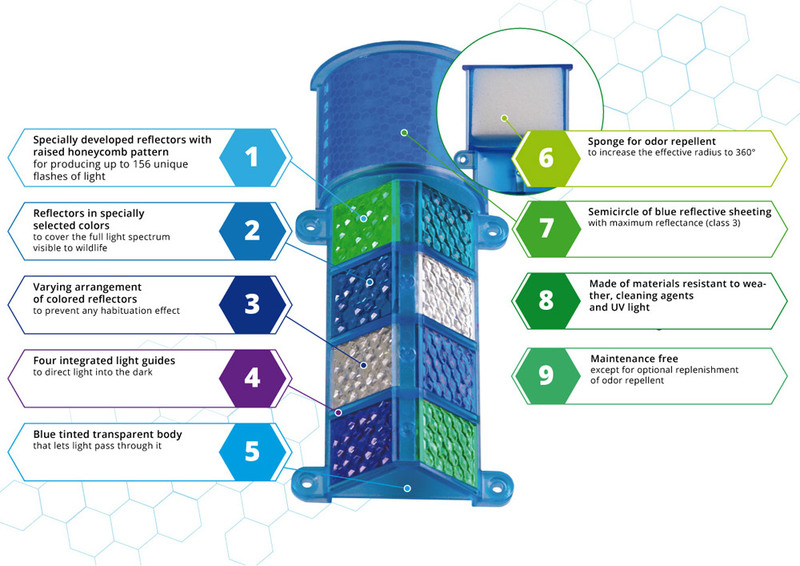 Our Multiwarn Wildlife Protector combines various functions within a single product. 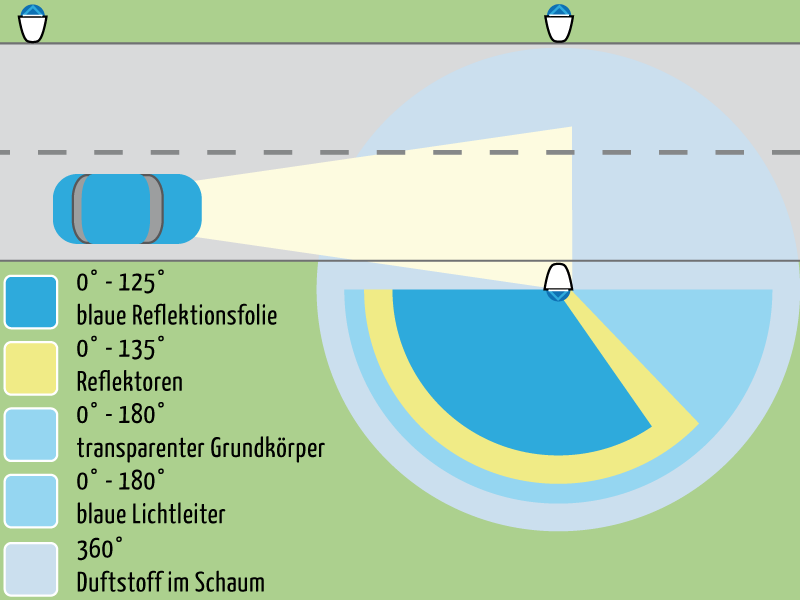 This makes it possible to increase the typical effective warning radius by five fold to 180° and optionally even further to 360°. Road accidents caused by wildlife have become a huge problem. The numbers are more than clear: Over 247,000 wildlife accidents were recorded in Germany in 2013* resulting in damages totaling some 560 million euros*. 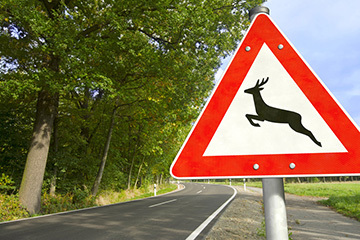 Statistically speaking, one in every five traffic accidents is a wildlife accident. These figures - and their upward trend - are even more alarming when you consider that road traffic in Germany has quadrupled over the past 30 years and that the country has built a network of roads that is second to none in the world and the backbone of its strong economy. So there is an obvious and urgent need for a fast and effective means for preventing wildlife accidents. Though it is widely believed that expensive fencing and wildlife bridges over roads and freeways can mitigate the problem, the fact is that they do not represent a comprehensive solution for the country’s entire road and freeway network. Most wildlife accidents occur on single carriageway roads and highways. Here, the cost of building a fully-linked system of fences and wildlife bridges makes any such plans illusory. In any case, such a system would severely limit the habitat and movement of free-roaming animals. In some regions of Germany, animals are being forced to develop ever new survival strategies to keep from being driven out of their territory altogether. They tend to stick to their traditional paths and crossings - some of which have been used for hundreds of years - and will repeatedly attempt to cross roads in their search for food, resting places or fellow members of their species. 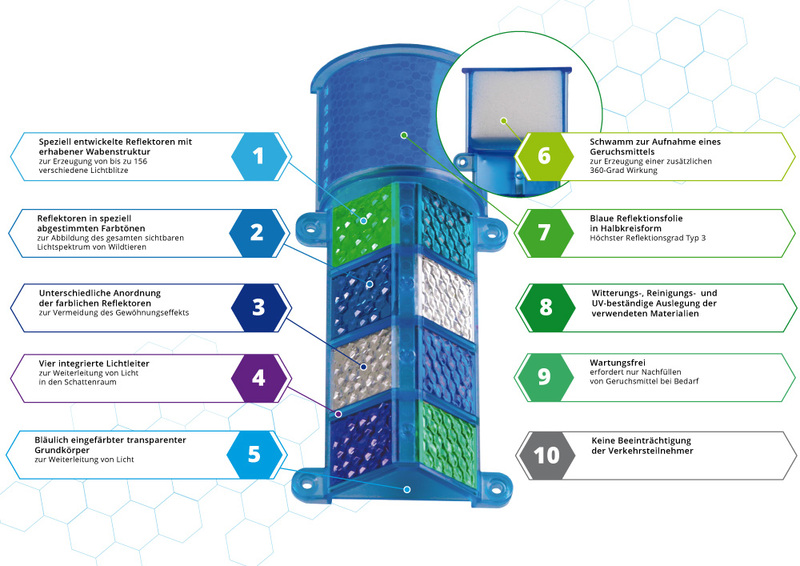 With our patent-pending Multiwarn Wildlife Protector, we offer a superbly equipped, highly effective and low-cost product that can be installed along any road or highway. 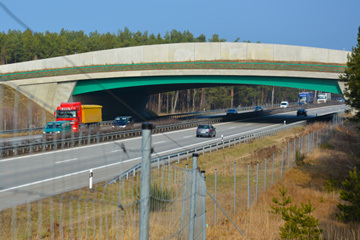 Three years of successful testing on selected sections of road in the state of Brandenburg testify to the effectiveness of the Multiwarn Wildlife Protector.